This is Tim Benton’s first London performance. 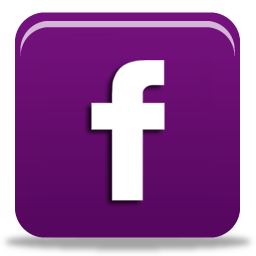 He has worked extensively in New Zealand and appeared in Australia and Hawaii. He’s played Professor Higgins in My Fair Lady, Jean Valjean in Les Miserables, Julian Marsh in 42nd Street, Magaldi in Evita and Pontius Pilate in Jesus Christ Superstar. A New Zealand National Opera chorus member, his play credits include Pygmalion, Broadway Bound and Hay Fever. He’s played the man in Sondheim’s two-hander Marry Me a Little and most recently featured in Tony Bennett Swings, a salute to the jazz legend. Originally from Blackpool, Michael trained at the Royal Scottish Academy of Music & Drama graduating with a Masters Degree in Performance in Musical Theatre. Prior to this he had studied Cell Biology and Pathology at the University of St- Andrews. Theatre Credits include Guilt(Upstairs at the Gatehouse); The Confessions of Julian Po and Iron Curtain (Edinburgh Fringe Festival); Wild Honey(RSAMD); The Fabulist, Like You Like It and About Face (Cardiff International Festival of Musical Theatre); The Tempest (Prague Fringe Festival and Byre Theatre, St- Andrews); Such Sweet Thunder (NYMT, Newcastle Theatre Royal). Jennifer recently completed an engagement with Les Miserables during which she played the role of ‘Fantine’ on numerous occasions at the Queen’s Theatre, London. She has also appeared as ‘Patience’ in a workshop presentation and cast recording of the Cat Stevens musical, Moonshadow. Before joining the Les Mis Company, Jennifer was on a No. 1 Tour of Cats, as part of the ensemble, and covering ‘Jellylorum’, ‘Jennyanydotts’ and ‘Grisabella’, all of which she performed several times. Immediately following her Postgraduate course at Royal Academy of Music in 2004 and Jennifer went straight into the UK Productions No 1 Tour of Jekyll And Hyde (with Paul Nicholas) in which she played ‘Nellie’ and for certain performances the lead role ‘Lucy’. She played ‘Mrs. Lovett’ in Sweeney Todd at the Glastonbury Festival and also had her first Panto experience playing ‘Robin Hood’ in Babes In The Wood for Bruce James Productions. In her native US, Jennifer played ‘Betty Blake’ in the US National tour of Will Rogers’ Follies and was Lead Vocalist in the Central American tour of Blues In The Night. She played ‘Lorraine’ in 42nd Street, ‘Anita’ in West Side Story, ‘Fruma Sarah’ in Fiddler On The Roof and ‘Angel’ in Anything Goes all at the Mac-Haydn Theatre, NY. Jennifer was Lead Vocalist in Brecht On Brecht at the Producer’s Club II, New York City and played ‘Yitzak’ in Hedwig And The Angry Inch at the Contemporary Amercian Theatre, OH. Her film and TV credits include The Yard for Miramax and New York Undercover Fox Television. Recordings include various musical theatre numbers for TER/JAY Records. Jennifer has a Bachelor of Music degree from New York University. This is John’s 3rd Dickensian musical having played Wemmick in Great Expectations (Liverpool Playhouse) & Sowerberry & Fagin in Oliver (The Albery); other West End appearances include nearly 2000 perfomances in The Mousetrap (St. Martin’s) Dearly Beloved (Aldwych) & Give a dog a Bone (Westminster). This Christmas he is playing Dame in Snow White at the Elgiva Theatre Chesham. He recently recorded audio books of The Turn Of The Screw & Desire & Pursuit of the Whole & has made over 100 radio broadcasts for Capital Radio & the B.B.C. as a member of the Radio Drama Co. in roles as diverse as a talking head in the Sony Award winning Master & Margarita & a Castrati in The Angel of Rome! National tours include Cat on a Hot Tin Roof, A Study in Scarlet, Whiteoaks, Scrooge with Antony Newley & a European tour as Doc in West Side Story. Regional credits include Pitlochry Festival, Bristol Old Vic, York, Cheltenham, Harrogate, Northcott Exeter & Lancaster where he played Quince in the 1st &10th Anniversary open air promenade productions of A Midsummer Night’s Dream. Favourite roles include Mathew Parris The Crucible, Major Flack Privates on Parade, Pirelli Sweeney Todd, Chaplain Catch 22, Richelieu Three Muskateers & Dr. Crippen! Richard trained at RADA. His previous Dickens work is in Our Mutual Friend (BBC), Great Expectations (BBC and stage) and Little Dorrit (film). His other film roles are in Scoop, Mrs Dalloway and War Requiem, and his television work includes The Secret Agent (as Stevie), The Choir and The Prince and the Pauper. He recently appeared in The Prime of Miss Jean Brodie in Washington, DC. His stage work also includes Private Lives (National Theatre), An Inspector Calls (tour), Easy Virtue and Breaking the Code (West End), Taking Steps (Vienna), An Awfully Big Adventure, When I Was A Girl I Used to Scream and Shout and Out of Order. Richard’s writing work includes the musical play Over My Shoulder in London and on tour. His recent book, Julie Andrews: an intimate biography (a Sunday Times Top Ten bestseller) is published on both sides of the Atlantic. This is Sarah’s debut performance since graduating in July from The Bridge Theatre Training Company, London. Whilst training Sarah played the role of Bernarda in Lorca’s House of Bernarda Alba, the narrator in Entertaining Strangers and Great Aunt Clare in the premiere of The Dating Game a new musicl by Alexander Abbott. Prior to training Sarah enjoyed performing many lead roles in both musicals and plays in the theatres of York. She is thrilled to be part of this fabulous show. Recent credits include: Signoria Fioria in Do I Hear A Waltz? and Kander & Ebb’s And the World Goes ‘Round (Landor Theatre); the premiere of Miller & Hammond’s When Midnight Strikes and the cast recording of the show (The Finborough); the Secretary of State in a new Tim Stimpson play One, Nineteen (The Arcola). She recently played the Singer in a short film Domestic Flight directed by Julie Edwards with a screenplay by Tilly Vosburgh and due for release in November. Earlier this year Susan directed a production of Stepping Out (De Valois Studio) and The Music Man (Kenneth Moore Theatre). Susan trained at the Guildford School of Acting. 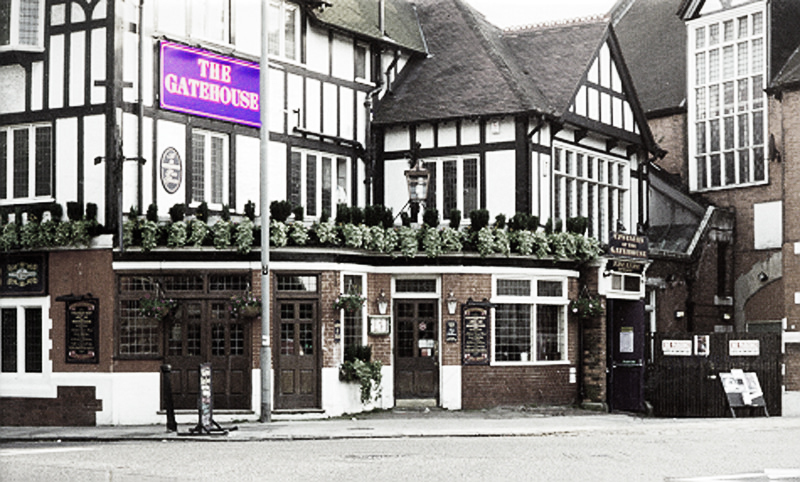 Tim is delighted to be appearing at the Gatehouse. Last year he appeared as Harry Bright on the International Tour of Mamma Mia! Past work includes creating the role of Bert Soloman in the play ‘Hell Fire Corner’. Ralph Rackstraw in ‘HMS Pinafore’ and several musicals including ‘Always’, ‘Oliver!’ ‘Joseph and the Amazing Technicolour Dreamcoat’, ‘Me and My Girl’, ‘Elvis the musical’, ‘My Fair Lady’ and many concert appearances. He can currently be seen on two television adverts, laughing and eating chicken, or falling asleep on a sofa, one for DFS and the other for KFC. It’s up to you to guess which! Tim is also an original performer of the corporate entertainment sensation, The Three Waiters. Rufus Graham was born and brought up in Edinburgh, studied Zoology at Oxford and the Harpsichord with Rafael Puyana in Paris and then became, among many other things, a classical bass-baritone in France. This millennium, he trained as an actor at Central School of Speech & Drama, and played President Truman in Ken Russell’s outrageous Xmas Movie for 2007, A Kitten For Hitler, among his many other roles. Check his IMDb profile as well! Tom, a graduate of the Royal Academy of Music, has appeared in many musicals including Disney’s Beauty and the Beast (Bookseller) and Chitty Chitty Bang Bang (Turkey Farmer/Inventor. 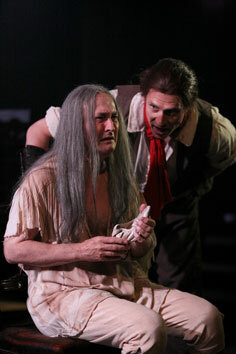 Opera includes Hansel and Gretel (Father) and Opera Soap at the BAC Opera season. Straight theatre includes Caligula in Camus’s Caligula. 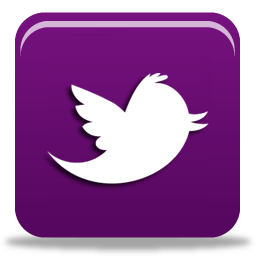 TV includes documentaries on Channel 5 (Britain’s Closest Encounters), BBC Learning Zone and Discovery Channel. Recordings include Les Miserables, South Pacific, Oklahoma and The Messiah. Tom performs regularly in cabaret. Recent credits include: Edward IV in Richard III (The Broadway, Lewisham), George IV in Reminiscence (The Space), Father Finnegan in Sam the Highest Jumper of Them All (Finborough). Timothy Wright trained at the Arts Educational School. 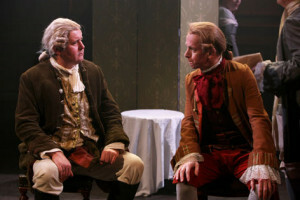 Since then he has appeared in Measure for Measure (the Cockpit Theatre), The Mousetrap (European Tour), Jack and the Beanstalk (Hull New Theatre), Judgement (Café Theatre) and Seasons (Chichester Festival Theatre). Film credits include: Sounds Films Little Dorritt. TV credits include: BBC’s Doctors and ITV’s The Bill. 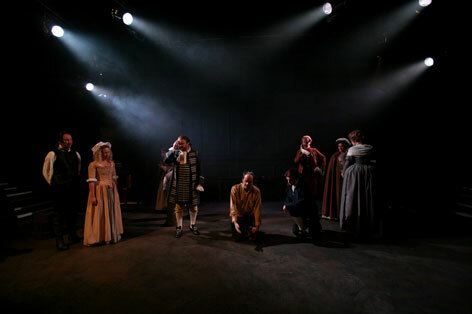 Adam trained at Bristol Old Vic. Theatre credits include: productions of King Lear and The Seagull ( RSC – Stratford, West End & World Tour); Scar & Pumbaa Lion King (Lyceum); Charlemagne Pippin, Colonel Hard Love of a Good Man and Richard Gaugleprixtown (Union Theatre); Cliff Danelaw and Ed Entertaining Mr. Sloane (White Bear) and Mr McNamara Wild Girl Wild Boy (UK Tour). Film & Television credits include King Lear –(Channel 4), Mortus Illumina (5ylac), Life and Death in Rome ( Sky) and The Bench (Channel 4). Radio includes Loves Labours Lost ( BBC), Tales for Christmas (BBC) and Papa Jo and the Grand Mogul. Having gained a first class honours degree in Drama and Education with QTS from UWIC, Cardiff, Amy trained in Musical Theatre at Mountview Academy of Theatre Arts. Mountview credits include: WOMAN 2 in Maltby and Shire’s Closer Than Ever at the Chelsea Theatre; SALLY BOWLES in Cabaret; DESDEMONA in Othello; LADY HELENA in Gut Girls. Other theatre credits include: FLUELLA in Tickledom (Upstairs at the Gatehouse); PRINCESS in Jack & the Beanstalk (Muni Arts Theatre); YUM YUM in The Mikado (St Fagans Open Air Theatre Festival); NANCY in Oliver! (New Theatre, Cardiff); MARIA in West Side Story (New Theatre, Cardiff); SUKIE in the Welsh premiere of The Witches of Eastwick (New Theatre, Cardiff). Other Credits include: Original cast recording of Only the Brave; Original cast recording of Tickledom; XTRA (S4C) and Can I Gymru (S4C). Originally from South Wales, Amy tours as a soloist with the Dave Barry Big Band and has performed in more pubs and clubs than she cares to remember. 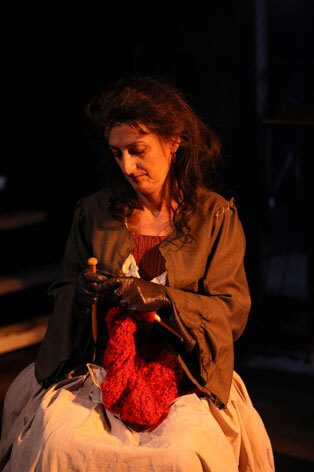 Amy is thrilled to be back at the Gatehouse this year to join the London premiere of ‘A TALE OF TWO CITIES’. THE light is dim, a sallow glow weighing on the stage set as though immersed in a nightly mist. The London premiere of the new musical based on the novel by Charles Dickens plunges you straight into an eerie atmosphere of impending doom. Set amid the turmoil of the French Revolution, this enduring classic follows the fortunes of a group of vengeful rebels intent on bringing the aristocracy down, and in their wake a story of love, revenge and sacrifice unfolds. waltzing in and out of sight, singing their hearts out in impressive synchronised fashion. Paul Nicholas, whose theatrical success began in 1969 in productions and lead roles in Grease and Jesus Christ Superstar, holds the directing reins in this latest adaptation of A Tale of Two Cities and introduces a cast of passionate actors intent on filling their songs with enough emotion to make you quiver. to belt out “It was the best of times, it was the worst of times…” the novel’s famous first lines. As the actors stand in line singing and looking straight at the audience, suddenly the small set has the advantage of creating an emotionally filled ambiance and one is left to wonder how much more powerful the renditions would be given a bigger stage. This latest adaptation of Dickens’s classic manages to transform an intense story into musical escapism with a cast that sizzles with emotions and conviction. 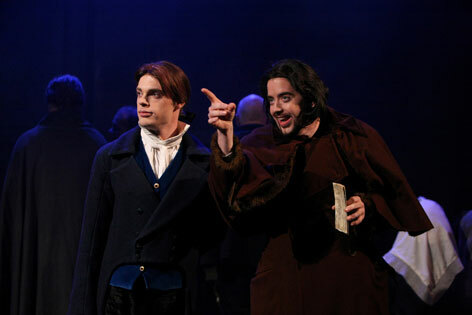 There are several musical versions of Dicken’s A Tale of Two Cities knocking about. There’s the version just opened on Broadway by Jill Santoriello, Howard Goodall tried his hand shifting the action to Russia a couple of years ago, and then there’s this version, receiving its London premiere at the Gatehouse. Condensing Dickens’ novel into a musical running at just over two hours is never going to be easy, but for the most part, this production succeeds rather well. The action positively dashes along – especially in the first half – but not at the expense of characterisation. Actors are mic-ed up and the sound levels are impressively controlled, especially bearing in mind the smallish auditorium, and they are given live accompaniment by two pianos. The style of the piece and its setting is reminiscent of Les Miserables, and while it isn’t sung-through, it’s rare for underscore or a musical number to be absent for long. Casting-wise, director Paul Nicholas has assembled (and well deployed) an impressive cast – Kiwi performer and London debutant Tim Benton is spot-on as the world-worn Sydney Carton. Jennifer Hepburn, as the object of his affections Lucie Manette, shows off a full and rich voice. All in all, well worth a visit to north London and this production could certainly enjoy a future life. Adapting a serious musical from Dickens’ novel, set in Paris and London before and during the French Revolution, while not eliciting comparisons with another French musical still in the West End, was going to be tough. Admittedly they are set in slightly different periods, but revolutionary French peasants are the same whether they are waving red flags on a barricade or, in this case brandishing red knitting. When it is Susan Raasay doing the brandishing, as a magnificently unhinged Madame Defarge with wild-staring, evil eyes and grasping wicked needles, you get the message that these are serious revolutionaries. The Tale follows once-aristocrat Charles Darnay’s flight from his evil Uncle, the Marquis D’Evremonde’s, assassination attempt into the arms and Sunday afternoon teas of the utterly English and epically beautiful Jennifer Hepburn as Lucie Manette. Tim Benton as Sidney Carton, dishevelled and slightly roguish solicitor who saves Darnay’s life and becomes a friend to the young lovers, is the classic yet unconventional literary English hero. As the excessively bad baddy, the mercenary Barsad, Paddy Crawley embraces the pantomimic, stopping short of encouraging boos. 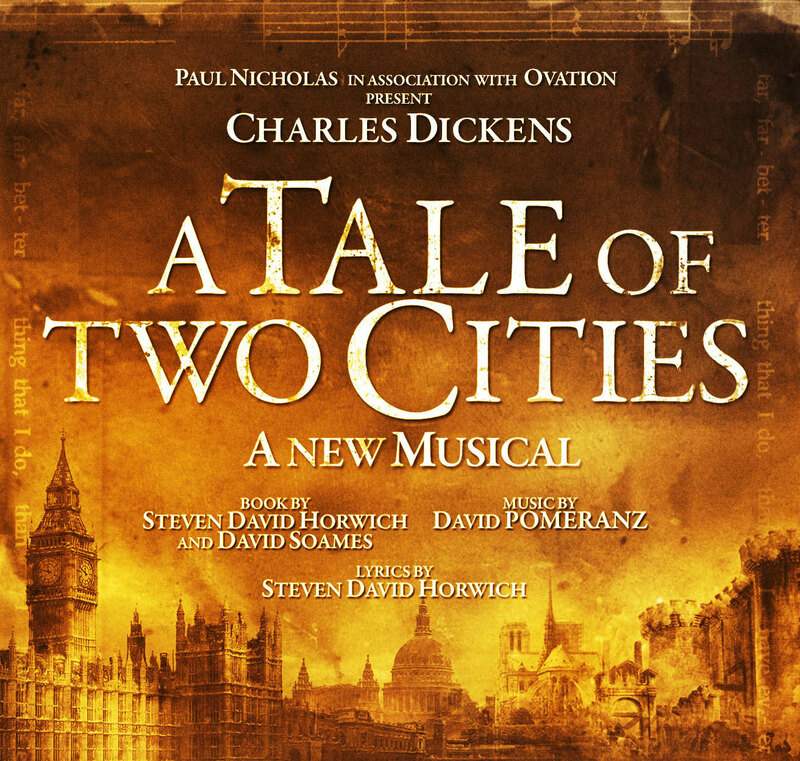 A Tale of Two Cities is an epic musical, with a score to match and songs that pleasingly lodge themselves in your head and leave you humming “The Best Of Times” all the way back down to the Tube. Both Jennifer Hepburn’s and Tim Benton’s songs of love and love unrequited thrill and lighten the gloom of Mike Lees’ dark wood panelled set. 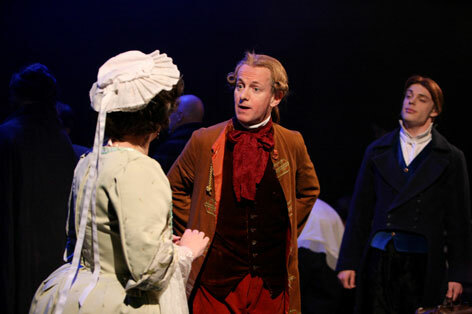 Horwich and Soames’ book thankfully précises Dickens for the stage but brings more humour than I remember and with Paul Nicholas’s tight direction it retains the drama and darkness of the piece, yet keeps it a compelling tale throughout. 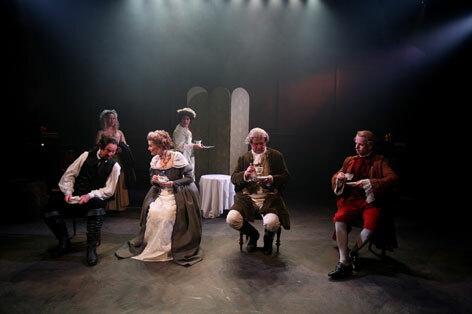 A Tale of Two Cities feels every part the epic classic musical, which keeps the pulses racing with stirring, impassioned music and characters to care about. A larger than usual cast for the Gatehouse fills the stage during the chorus pieces and builds on the theatre’s reputation for attracting seriously fine performers who deliver seriously fine performances. Another musical triumph well worth the walk up the hill. A beautiful tale of love and sacrifice. The French Revolution is a gift for the creators of musicals, and the Dickensversion of the story is probably the best ever with the author’s genius for creating unforgettable characters. Sidney Carton must rank with Rhett Butler as one of the most fascinating romantic heroes ever. A drunken rake reformed by his love of a good woman who sacrifices himself for his preferred rival is irresistible. Tim Benton as Carton is personable, with a resounding baritone and his final number tears the theatre apart. 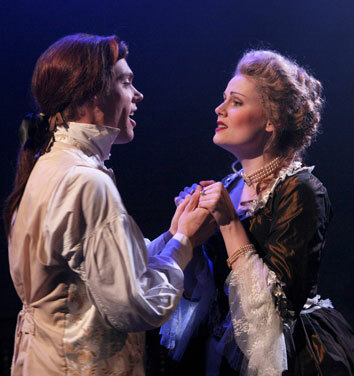 The lovers Lucie (Jennifer Hepburn) and Charles (Michael Stacey) are never as interesting as the other characters, but they have good numbers to sing and they take advantage of every opportunity – as do the rest of the company, who have all got great voices. 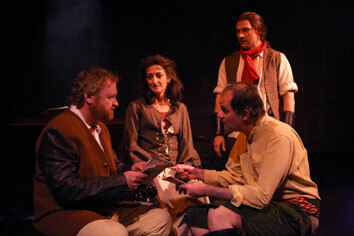 Especially impressive are the revolutionary Defarges played by Tim English and Susan Raasay. A highlight is their early number The Freedom We See and the intensity builds around them until Madame Defarge’s final aria of hatred and revenge. 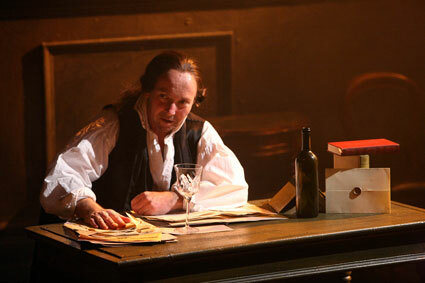 John Fleming as the long-suffering Dr Manette has great sweetness of voice and gives a heartbreaking performance. There are sprightly scenes – the relationship between Jarvis Lorry (Richard Stirling) and Miss Pross (Sarah Dearlove) bring light relief to the somewhat bleak story. The small venue is perfect for this kind of production. The audience is so close that they are almost part of the action, seemingly surrounded as they are by the sound. Nothing needs to be said of the expertise of the writers, who are all at the top of their professions. The music and lyrics fit the story perfectly and I see no reason why this production should not have a lasting afterlife. This is a strictly concert version of the musical with just two pianos and a minimalist setting. It is beautiful to look at – like a series of paintings by Jacques-Louis David, the lighting of Howard Hudson against a plain dark background highlights the tasteful grouping by director Paul Nicholas and the appropriate costumes by Mike Lees. A stunning production – not to be missed. No, the RZ hasn’t made a journey to see the tripe currently running on Broadway. This OTHER version of the classic novel, running at Upstairs at the Gatehouse, is the brainchild of David Pomeranz (score), Steven David Horwich (Book/Lyrics) and David “I wrote the part of Time everybody hated” Soames (Book) manages to do what the big bad Broadway edition couldn’t: condense Dickens’s epic into a svelte 2:40 (with interval) without sacrificing characterisation or major events in the plot. Director and co-producer Paul Nicholas has brought together an excellent and experienced cast (no fresh faced pre-drama schoolers here like the upcoming cast of Spring Awakening), and in this case things do get better with age: they sell the show marvellously. While the occasionally clunky line shows up in the text, it doesn’t get in the way, and Pomeranz has supplied a chamber score reproduced here on two pianos. Sound tech (no sound designer is credited) Andy Evans has gone above and beyond the call of duty to provide a wonderful mix which, given the large cast and small space, is no easy task. Mike Lee’s costumes are lovely to stare at and his set design is clean and simple. Sometimes smaller is better, and this intimate production is worth checking out. The RZ would not be surprised were it to have a lovely future ahead. There’s a gem of a show here, and with some polishing it can become brilliant. EVERY now and then there comes the chance to discover a new gem, a show which revives your passion for musical theatre and sends you home wanting to tell the world to see it. 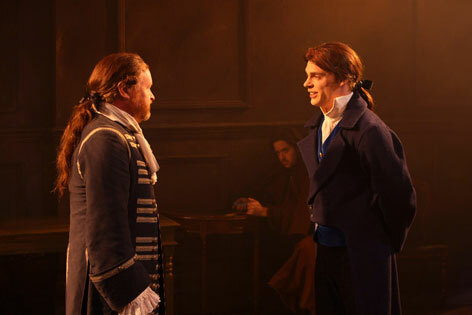 This London premiere of A Tale of Two Cities is such a joy it deserves to be championed – give it a full orchestra and larger theatre and this could be the new Les Miserables. Of course, there are similarities between this new show, based on the classic Charles Dickens novel, and Victor Hugo’s epic tale. Not least that they’re both set during the French revolution and tell of a man’s fight for justice, the battle between the poor and the aristocracy, interwoven with a classic tale of unrequited love. Happily, they also share soaring tunes, evocative underscoring and a gripping, powerful story of sacrifice. London stage newcomer Tim Benton tells his story with aplomb, his opening and closing lines as quick-minded barrister Sydney Carton shared with the original novel. He carries the tale along from “It was the best of times, it was the worst of times” to “It is a far, far better thing that I do than I have ever done; it is a far far better rest that I go to, than I have ever known,” the latter sung with true depth of emotion. But this is an ensemble piece and there’s not a weak link. 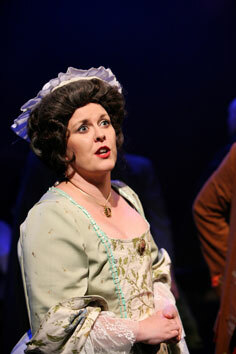 Jennifer Hepburn is a glorious soprano who makes Lucie Manette a genuinely pleasing leading lady. 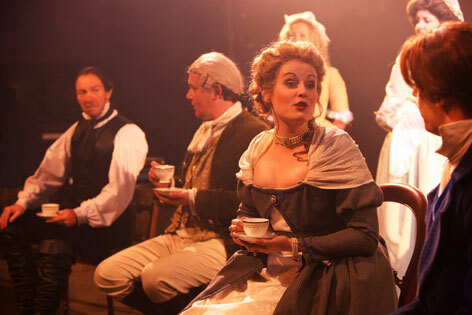 Her final few scenes and beautiful duet with noble husband Charles Darnay (earnest and likeable Michael Stacey) are packed with emotional punch, while Sarah Dearlove and Richard Stirling provide the comic relief as Miss Pross and Jarvis Lorry. There’s an exquisite trio too between Carton, Manette and Darnay, as good as anything you’ll hear in bigger blockbuster musicals. Director Paul Nicholas keeps the story tight (book by Steven David Horwich and David Soames) and the action moves swiftly – good news for a story which spanned three books The musical numbers, with lyrics by Horwich and music by David Pomeranz, manage to be both intelligent, accessible and pleasing on the ear. The set is simple and the performers transform it easily from aristocratic homes to courtroom, London to Paris and vice versa. It’s atmospheric, enthralling and moving – and whether you’re fascinated at the historical tale or end up bawling at the tragedy, it IS the best of times. A must-see.